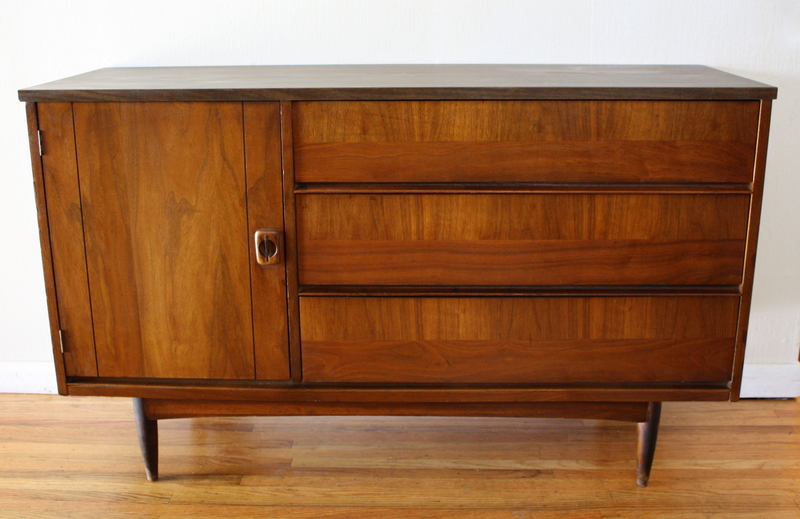 This is a mid century modern credenza by Stanley. It has their signature accented silver knobs, and a half moon door pull design on dual side cabinets with shelving. 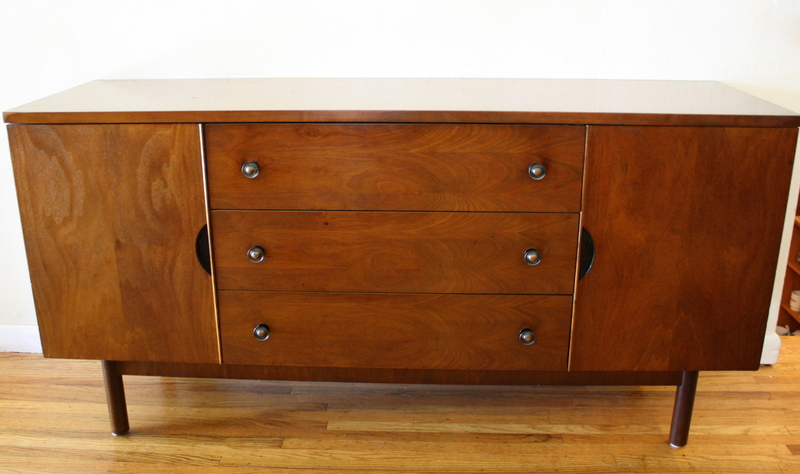 Dimensions: 60″ W x 18″ D x 30″ H.
This is a mid century modern low dresser credenza by Stanley for Van Sciver. It has tapered legs, and 9 dovetailed drawers: 6 drawers on the ends with silver inset knobs, and the 3 middle drawers have a streamlined design. Dimensions: 64″W x 18″D x 30.5″H. This is a mid century modern tall dresser by Stanley. It has 5 dovetailed drawers with Danish style solid wood pulls, and arched base. Dimensions: 36″W x 18″D x 43″H. These are 3 pairs of mid century modern side end table nightstands. The first pair is by Stanley, has a slanted design with a top shelf, dovetailed drawers with a brass knob, and tapered legs: 22″W x 14″D x 23″H. The second pair has dovetailed drawers with a streamlined drawer design, tapered legs and a bottom shelf: 20″W x 14″D x 24″H. The third pair has beautiful sculpted handles on 2 doors and an arched base: 22″W x 16″D x 25.5″H. 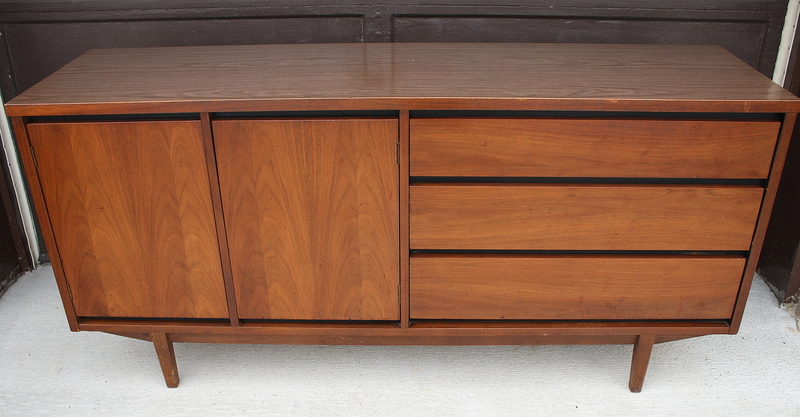 These are 2 mid century modern credenzas. The first credenza is by Stanley, has 2 side cabinets with sculpted doors and 3 dovetailed drawers with carved wood handles. The top has an interesting cut out notched top design that compliments the sculpted drawers: 56″W x 19.5″D x 32″H. The second credenza by Bassett has 1 side cabinet, 3 dovetailed drawers with a streamlined design, and tapered legs: 48″W x 18″D x 30″H. This is a selection of mid century modern low dresser credenzas. The first is from the Broyhill Emphasis collection. It has 9 dovetailed drawers, the signature routed curves, and sculpted wood handles: 72″W x 19″D x 31″H. The second low dresser credenza is by Dixie. It has 9 dovetailed drawers with a streamlined drawer design, brass knobs, and an arched base with tapered legs: 64″ x 18.5″D x 32″H. The third is by Stanley. It has 9 dovetailed drawers with a sculpted drawer design, brass knobs and brass tipped tapered legs: 64″W x 18″D x 30″H. 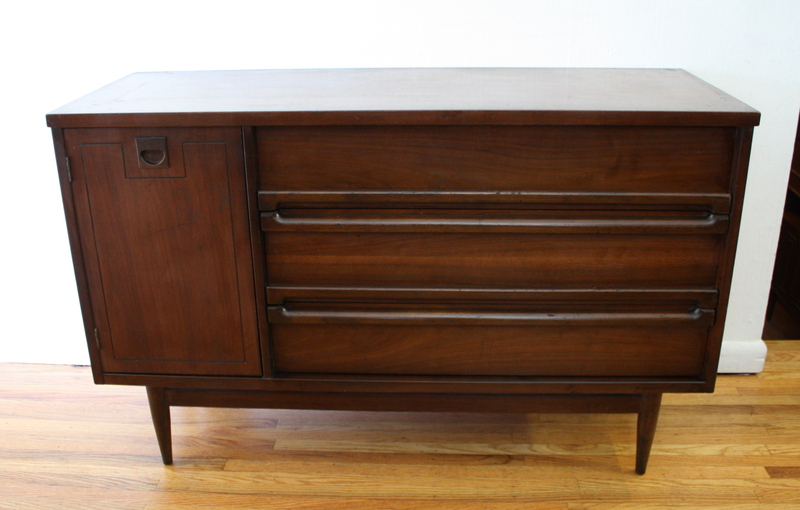 All low dresser credenzas are sold. 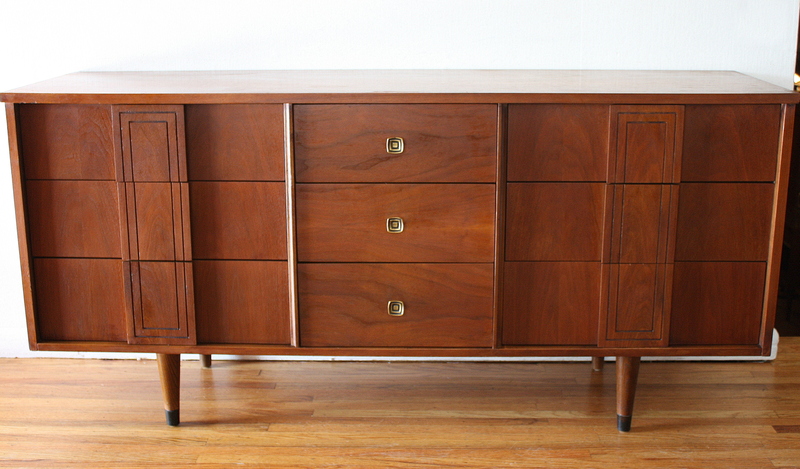 This is a selection of our mid century modern credenza low dressers. 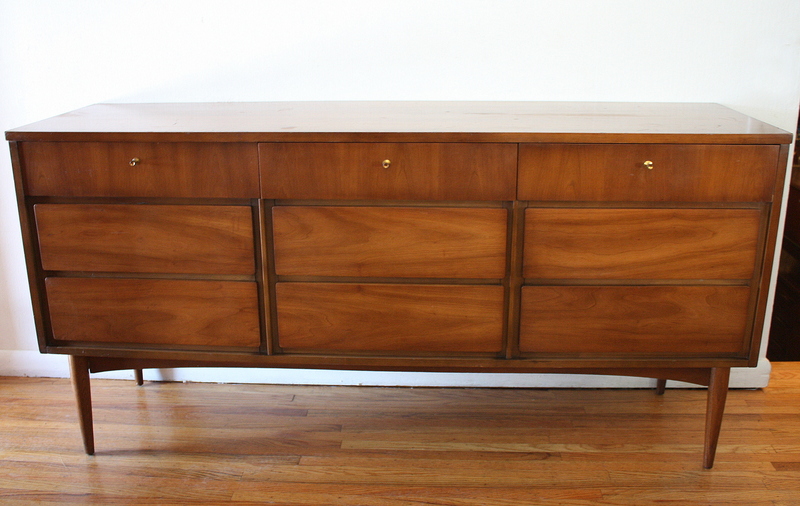 The 1st credenza has a beautiful parquet design, a side cabinet with shelves, 3 dovetailed drawers, and tapered legs: 51.5″W x 18″D x 31.5″H. 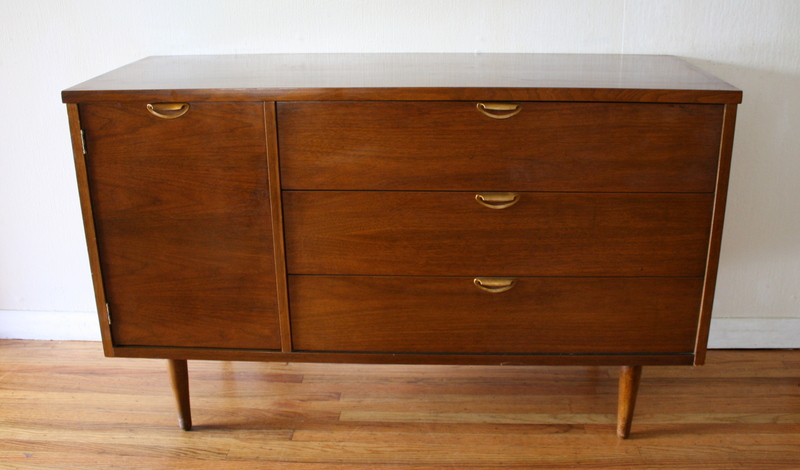 The 2nd credenza is by Bassett, has 1 side cabinet, 3 dovetailed drawers, and tapered legs: 48″W x 18″D x 30″H. 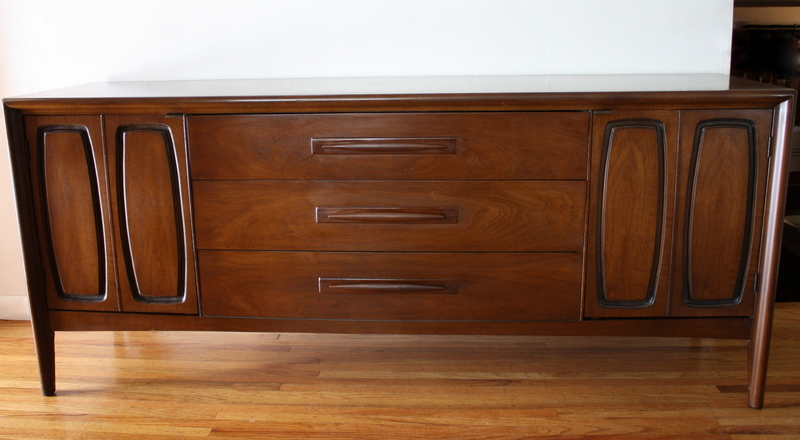 The 3rd credenza is by Stanley, has 2 side cabinets, 3 dovetailed drawers, and tapered legs: 60″W x 18″D x 30″H. This is a mid century modern pedestal desk by Stanley. It has 4 dovetailed drawers with their cool signature knobs. Dimensions: 46″W x 18″D x 30″H. 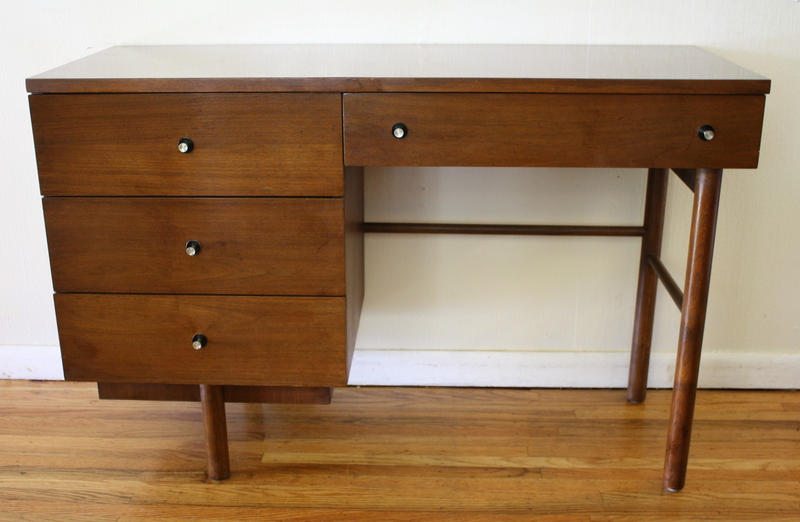 These are 3 mid century modern tall dressers. The first is solid wood made by Stanley with cool metal knobs, formica top, and 5 dovetailed drawers: 36″W x 18″D x 43″H. The second is solid wood made by Bassett, has 4 dovetailed drawers and has brass drawer pulls as well as streamlined drawers: 40″W x 18″D x 43″H. The third is also solid wood made by Bassett, has 5 dovetailed drawers with a streamlined design, and tapered legs: 40.5″W x 18″D x 45″H. Please check captions for prices and availability. 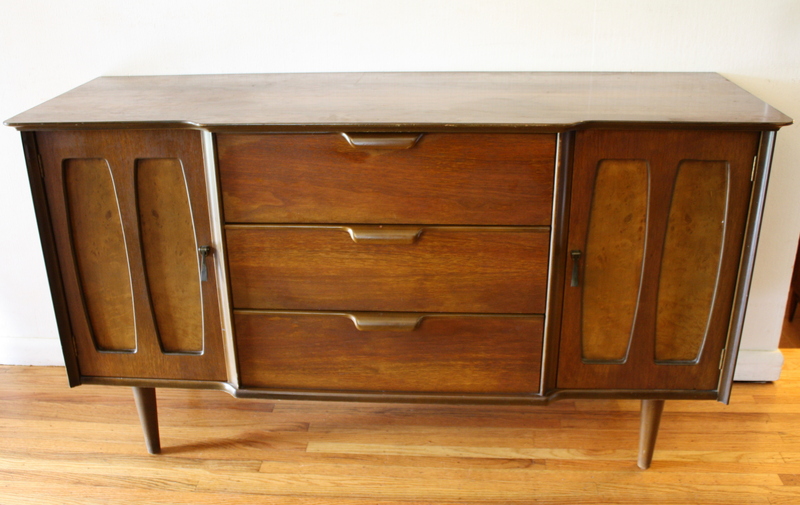 This is a mid century modern credenza made of solid wood by Stanley. It has a formica top and 3 dovetailed drawers. It also has two 2 side by side vertical compartments. If utilized as a bar, the first compartment has a shelf and can store short and tall glasses. The second compartment is perfect for storing your liquor.